When it first appeared in the lead-up to the 2016 election, Brown Is the New White helped spark a national discussion of race and electoral politics and the often-misdirected spending priorities of the Democratic Party. This “slim yet jam-packed call to action” (Booklist) contained a “detailed, data-driven illustration of the rapidly increasing number of racial minorities in America” (NBC News) and their significance in shaping our political future. 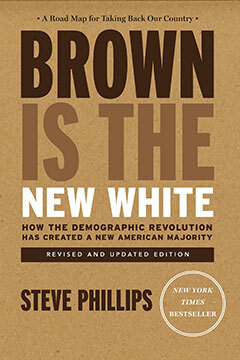 Completely revised and updated to address the aftermath of the 2016 election, this first paperback edition of Brown Is the New White doubles down on its original insights. Attacking the “myth of the white swing voter” head-on, Steve Phillips, named one of “America’s Top 50 Influencers” by Campaigns & Elections, closely examines 2016 election results against a long backdrop of shifts in the electoral map over the past generation—arguing that, now more than ever, hope for a more progressive political future lies not with increased advertising to middle-of-the-road white voters, but with cultivating America’s growing, diverse majority. Emerging as a respected and clear-headed commentator on American politics at a time of pessimism and confusion among Democrats, Phillips offers a stirring answer to anyone who thinks the immediate future holds nothing but Trump and Republican majorities. —Reverend Raphael Warnock, senior pastor of Ebenezer Baptist Church, spiritual home of the Reverend Dr. Martin Luther King Jr.